Many of our customers require unbranded pouches and need a regular supply, but don’t have the facilities or space to store large quantities of pouches onsite. This service is available for bespoke unprinted pouches and all of our stock pouch packaging. You can choose from stand up pouches, 3 side seal pouches and open top/bottom pouches in a variety of materials and finishes. If you require unbranded pouch packaging on regular basis, our bulk stock service is the right solution for your business. Stop worrying about finding the facilities and space to store large pouch quantities on site – leave the storage to us and reap the benefits of having a regular delivery of stock pouch packaging on your doorstep. What are the benefits of using wholesale stock packaging? There are a number of advantages to choosing pouches as your preferred packaging method. For one, plastic pouches are a fantastic solution if maintaining the freshness of your products for longer, is a priority in your line of business. In addition to longer shelf-life, our pouches also protect your products from UV light, oxygen and moisture to assure high customer satisfaction and positive brand image. In addition to safeguarding the quality of your products, pouch packaging is also a great way to boost your brand visibility. For small businesses in particular, finding marketing techniques that both fit within the budget and deliver tangible results is often a challenge. Samples are a fantastic form of inexpensive marketing that has stood the test of time – and purchasing bulk stock pouches for your product samples is both convenient and affordable. What’s more, there are stock pouches available for all types of products – so regardless of whether your goods are solid, liquid or a paste, you can hand out samples to your heart’s content. What can you package in stock pouches? Want to ensure your samples stand out even more? Our stock pouches are incredibly customisable: whether you need clear pouches to display stunning goods, or chrome pouches to boost the luxurious feel of your offering, you can order these wholesale from us. Our Kraft windowed pouches are another great choice for showcasing your products, and will add a natural look and feel to your packaging. 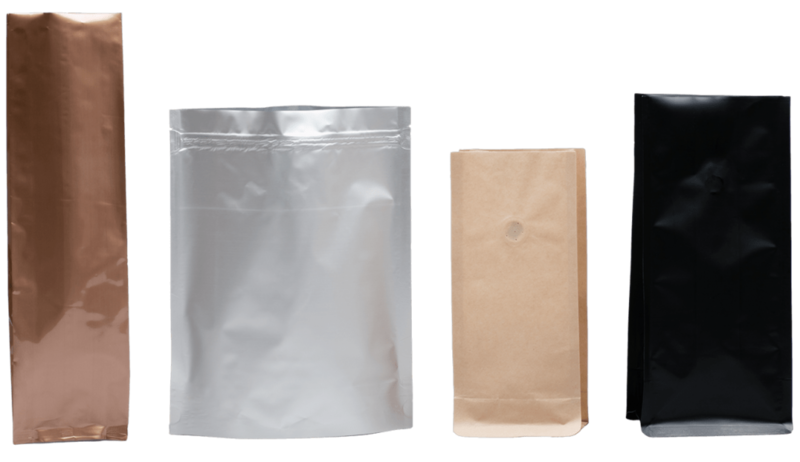 We also offer aluminium stock pouches in bulk, for those who need extra sturdy packaging to protect their products from moisture and bacteria. View our stock pouches for more stock pouch packaging options you can order in bulk.